This review will be sort of split up by section, since there's a wide variety of material in this book. 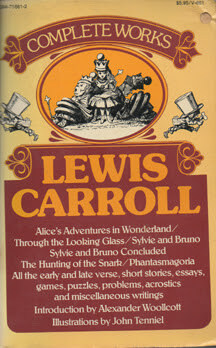 The book starts out with Alice's Adventures in Wonderland. Of course, this story is simply delightful. I'd read it before, and it's what made me figure I'd enjoy Carroll's complete works. It has just the right amount of nonsense, and the characters are simply delightful. And this is one of those books that was adapted to film so well that having seen the movie actually increases my enjoyment of the book. I have perfect images in my mind of the Mad Hatter, the Cheshire Cat, and the Red Queen. The next story is Through the Looking Glass. It's sort of like a continuation of Wonderland. Alice steps through a mirror and finds another strange world. I don't enjoy this one as much as Wonderland. The characters she encounters are much less likable. Many of them are sort of mean and annoying. And the nonsense in this story (normally an element I enjoy) gets to the point where I don't even know what's going on anymore. Sylvie and Bruno took me a while to get into. After a bit I figured out that the narrator was alternating between dreaming and reality, but there was no transition, so in the beginning I was just confused. Once I got the hang of the switching back and forth, I started to get into the story. It's much slower moving than the Alice stories. However, Sylvie and Bruno are such adorable characters that I still found it worth reading. Then comes Sylvie and Bruno Concluded. By this time, it's difficult to get through. Sylvie and Bruno, and some of the other characters, are quite delightful, but the story simply doesn't go anywhere! People visit each other, and go for walks, and various people tell nonsensical stories and sing songs. So while some parts are enjoyable, as a whole, it's not so much a story as just a lot of randomness, and it took me a very long time to read. Stories should have plots, I feel! The next section is Verse, and that part was a really mixed bag for me. Hunting of the Snark was lovely, as was a lot of the early stuff. But then there were some that were seemingly written in Scots, and some that were very difficult riddles, and some that were just so nonsensical that I didn't get anything out of them. The rest of the book consists of short stories and other really random stuff. I confess, I didn't read much of these parts. By this point I was exhausted by the book, and nothing I started reading really grabbed me. Maybe at some point I'll read some of these parts, but for now I need a break from Lewis Carroll. So, while Alice's Adventures in Wonderland is delightful, the whole book gets 2 stars from me. This book counts for the Mount TBR Reading Challenge. It is also one of my longest books (it was the very longest on my to read shelf, in fact! ).